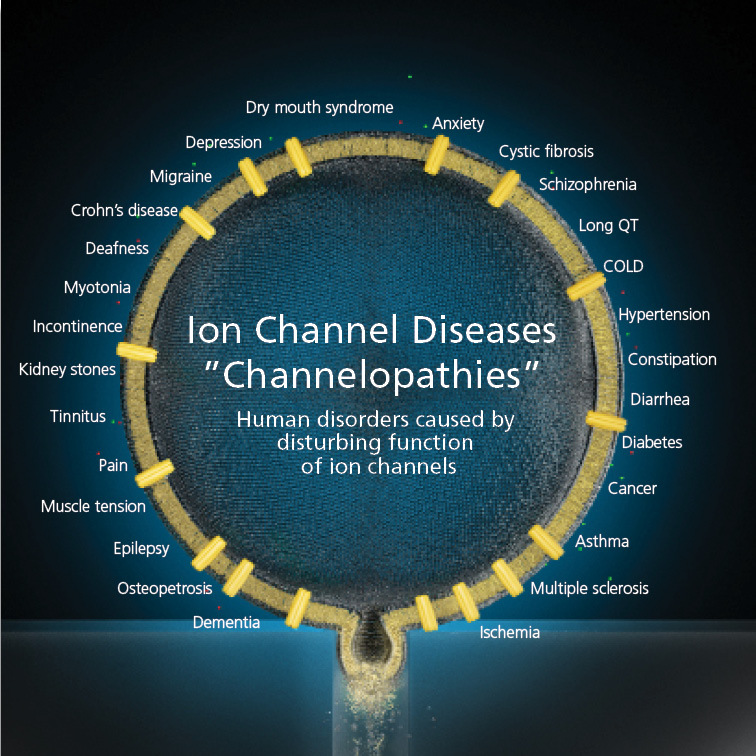 A multitude of human and animal diseases are caused by ion-channel dysfunction. This may be genetic, i.e. caused directly by mutations in genes coding for ion channels. Such diseases are called ‘channelopathies’. Examples of channelopathies are cystic fibrosis, epilepsy, and cardiac arrhythmias, e.g. the long QT syndrome. Diseases may also result from defects caused by mutations in genes coding for proteins that regulate ion channels. Alternatively, ion channels may be involved in non-genetic diseases, e.g. diarrhea, which is mediated by toxicological effects on ion channel function. The search for new, potent and selective drugs that interact with specific ion channels is strongly technology driven and focused on high-throughput screening. Active substances from these high-throughput screens are further analyzed in functional studies, such as patch clamp. This development towards screening at the molecular level has been enabled primarily by: 1) the cloning and expression of relevant ion channels in cell lines, and 2) novel biological high-throughput screening techniques. has proven to be extremely useful in revealing many aspects of ion channel function. However, the traditional patch clamp technique has serious shortcomings in pharmaceutical discovery and screening, because the throughput is low, and it requires highly specialized personnel. With the advent of automated patch clamp equipment these shortcomings are largely eliminated. QPatch and the Qube allow an operator without prior electrophysiological knowledge to conduct experiments. You can be a patch clamper too, with the help of the highly skilled application scientists at Sophion, or a skilled electrophysiologist in your staff!